If your life flashes before your eyes when you think you're about to die, then it's a pretty good bet that you're going to be in for a pretty good show when the threat to your existence is a giant demon. The Longest Five Minutes has an undeniably intriguing premise that turns the typical Japanese role-playing game formula on its head. Rather than waking up at the start of your adventure with amnesia, you come around stood right in front of a final boss with no idea of who you are or how you got there. Over the course of a five minute final battle you'll have to stop time and dive into your memories to figure out how you got there and re-experience the events in order to get the skills you'll need to win the day. What follows is an examination of JRPGs turned on its head. You'll wade through your memories, fighting monsters; exploring dungeons and interacting with non-player characters while you piece together your fragmented memories. 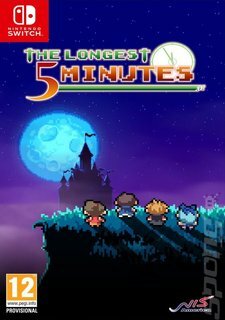 With retro 16 bit style graphics and a nostalgic soundtrack, The Longest Five Minutes will be a trip down memory lane for a lot of gamers, too. The fragmented nature of the narrative also has the effect of making it surprisingly easy to pick up a controller and play in bite-sized chunks for its genre. So, while there's plenty here for players to sink their teeth into, it's also unusually accessible for an old-school JRPG.